Madley, UK. 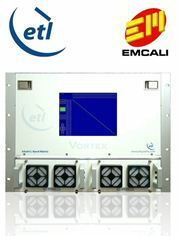 21 February 2017: ETL Systems, a global designer and manufacturer of RF signal distribution equipment for satellite communications, has been chosen by Colombian telecommunications, water and electricity services provider, EMCALI, to provide RF equipment for its Cali teleport expansion project. EMCALI required a 32 input x 128 output L-band matrix system that could be used to manage L-band signal necessary to improve operation and performance of video and data traffic. This in turn would improve the quality of service to end-customers and offer a more robust operation, allowing power to be provided to several low-noise block (LNB) downconverters and compensate for loss individually on each channel. ETL’s Vortex L-band Matrix VTX-10 system, commonly used for many high resilience high performance applications, and the Piranha PRN-10 LNB powering system – which is highly energy efficient and is populated with variable voltage – was selected by EMCALI to fulfil these requirements. ETL designed a system that easily expands into a 32x192 L-band matrix system to adhere to EMCALI’s future requirements whilst minimising downtime, allowing the company to provide enhanced communications without affecting the traffic running through the system at the time. For further information about ETL Systems please see http://www.etlsystems.com/. ETL Systems is privately owned and has been designing and manufacturing RF equipment since 1984. Its growing global presence accounts for 80 per cent of its total exports from the UK, where ETL is based. ETL designs and manufacture professional RF distribution equipment for satellite ground stations and other microwave users. The product range includes L-Band Routers, Switches, Splitters, Combiners and Amplifiers covering DC-40GHz. Reliability, resilience, and RF performance are the core customer requirements which drive ETL’s product innovation and development. Adaptability and scalability combine with these to provide future expansion. With its dedicated in-house engineers based in Herefordshire, UK, ETL Systems has seen an average growth of 20 per cent in the last five years and has won three Queens Awards for International Trade. EMCALI is a state-owned company providing public services of water, telecommunications, and electricity services in Cali, Colombia. It began operations in 1931 in Santiago de Cali, later expanding into Cali, Yumbo and Puerto Tejada. Currently it provides public services and telecommunications services to millions of customers in Colombia.